Let us start with the main negative – Scarface: The World Is Yours is simply a port of a year-old PS2 and Xbox game. That said, a good game is most often a good game no matter what platform it’s on and, unlike Prince of Persia: Rival Swords, Scarface doesn’t try to hide that. In Scarface, you take control of Tony Montana in the final scenes of the film – straight after “Say hello to my little friend” – and fight your way out of the mansion (rather than ending up sleeping with the fishes). The rest of the game takes place 3 months after this, where Tony has lost everything and must reclaim what’s his and get revenge on Sosa. There are no extras for the Wii version, so the main difference this time is the controls. The main functionality is the pointer used for aiming and the camera. You chose between 4 different sized bounding boxes to get the right balance of aiming and camera control (the start of the tutorial lets you cycle through the modes without needing to change it on a menu – making it easy to select the right one for you). The pointer functionality works well, and if you point off-screen the camera will “reset” itself to a default camera, which is great for walking around – you can rest your arm like this. You can also use Z to lock-on to enemies, and mixing lock-on and manual aiming works great. Melee weapons are used by holding down B and waving the remote – unfortunately the chainsaw isn’t pulled off as well as it could have, as the controller doesn’t rumble when it’s active and no chainsaw noise comes out from the speaker. The nunchuck’s motion sensor is used for taunting, which feels good when someone hits your car and it’s not your fault. The taunt is also mapped to a quick press of the A-button, which you hold to run. On a few occasions, Tony taunted (and he walks very slowly while taunting) when I wanted to run, but most of the time it works well. Speaking of driving, the layout of the Wii Remote & Nunchuck makes driving around randomly very relaxing, as your hands are not cooped up together. Aiming while driving is also made possible thanks to the remote – acceleration, turning, aiming and shooting is simply impossible on traditional controllers. The missions in Scarface are split up into three main types. First are the standard missions you select from Tony’s satellite phone. There’s a bit of variation, but before too long you’ve done most of the different types. Some involve beating someone up, finding a gang hideout and killing them all; others require you protecting someone; basically they all require driving somewhere and shooting people, then driving away. The variation improves as you purchase a driver, enforcer and assassin – you can take control of each one and perform missions that are specific to each one. Completing the standard missions will get you supplies of cocaine, which you can sell on the street or to your fronts. Fronts are basically businesses you can purchase. Before doing so, you must complete a mission. These missions are quite varied. One involves protecting the store from gangs, another involves sniping a target and another involves ramming someone off the road, and beating him up to get something off him. After completing the mission; you can purchase the place to use as a drugs front and to take over each part of Miami. The missions which advance the plot are more like a normal action-adventure shooter than a free-roaming game, and usually take place in buildings, involving shooting your way past a small army to your target. This is where having balls becomes vital. 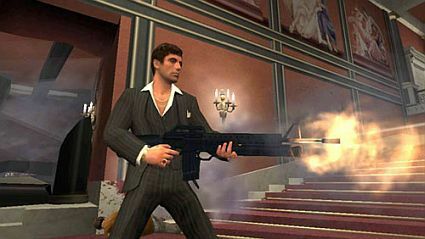 Tony Montana has a “Balls Metre”, which he fills up by shooting people in specific places like the groin or kidney (extra balls are given for not using the lock-on), taunting after you shoot someone, completing conversations with civilians (who you can’t kill when playing as Tony – it’s not his style – but you can when you play as the secondary characters like the driver), and driving Burnout-style. When the Balls Metre is full, you can shake the nunchuck to enter “Blind Rage” mode. When Blind Rage is triggered, the game temporarily enters a first person viewpoint, and makes Tony invincible and gives him infinite ammo. Killing people while Blind Rage is active also gains Tony’s health back, so it’s best used when Tony is low on health. Blind Rage is vital for the more difficult missions. You also have to keep an eye on the “Gang Heat” and “Cop Heat” metres. They basically show how much rival gangs and the police want you dead. You can reduce this heat by bribes, or intimidating gangs and sweet talking cops. Both of these make use of a special metre – You hold A to fill up the metre (it fills up, then “empties” itself just after its full), then let go. The aim is to get the bar as full as possible – there are different “success” rates on the bar, so getting a full bar will get the best possible result, and an empty bar will get you the worst possible result. This is also used for many other things in the game – such as laundering your money in a bank (if you die, you lose all the money not in the bank) to get various rates (the bank takes a percentage of the money you put in for itself) – this adds a lot of immersion into the game, as opposed to simply pressing a button to get one pre-set result. The in-game Miami feels fairly large to start off with, but the sense of freedom is somewhat ruined, as there is pretty much only one route around the place – most of Miami is one big road with some side-streets (that mainly require you to get back on the main road where you get off), others are housing estates which may as well be one road with a few side-streets. It looks rather nice, too, particularly in the day (thanks to some good lighting). The cars are sufficiently detailed but the character models, however, are rather poor, and there isn’t much variation at all. Another aim of the game is to improve your reputation. You do this by completing the main missions and purchasing “exotics”, ranging from henchmen, to decorations for your mansion to cars and boats. Cars and boats that you buy are then available from the driver menu, accessible anywhere in the game, minus plot-developing missions, so you always have a car nearby after a quick phone call – stealing cars bump up your cop heat. Once destroyed, you have the option of repairing the car, but this costs money for all but the default car. The default car is the so-called “QM Convertible” (cars are based on real ones, but with fake names, as always for these games) from the original move – complete with tiger skin innards. That’s another thing that Scarface: The World Is Yours excels at – it retains the feeling of the movie. There’s a massive amount of swearing and gore when needed. The main character model looks like Tony Montana, walks like Tony Montana and talks like Tony Montana. Even though Al Pacino doesn’t do the voice work, he also sounds just like Tony Montana – the sound-alike really does sound like him. Al Pachino helped to pick him, too. The soundtrack uses music from the same time-frame as the movie, and includes music from the movie itself, so the soundtrack is rather fitting. So, overall, Scarface is a pretty darn good game. There’s plenty to do, and it’s a lot of fun too. There a few problems and a little lack of variation, but the game works very well on the Wii. If you’ve already completed the game on another console, don’t bother. There isn’t anything new here. For those who are fans of Scarface, as well as fans of the genre, it’s well worth a look. There’s already two similar games on the Wii – Godfather and Driver: Parallel Lines – but this one is probably the best choice. There is an awful lot to Scarface, and always plenty of different things to do. Miami could have a better layout in the game, but other than that there isn’t really anything the game does wrong. Besides, none of the others have its own swear button.